Sharon Hofer owner and creator of Creating a Masterpiece is a professional artist and teacher. She has taught hundreds of students both young and old in her home town in Nebraska. Sharon's classes became so popular and due to overwhelming requests to join and a growing waitlist she decided to develop a DVD curriculum for school age students. In 2010 she began filming and now offers 5 levels of art curriculum. We received two great DVDs from Creating a Masterpiece to review. The first product we received was "Sunflower Lessons in Pencil Drawing." 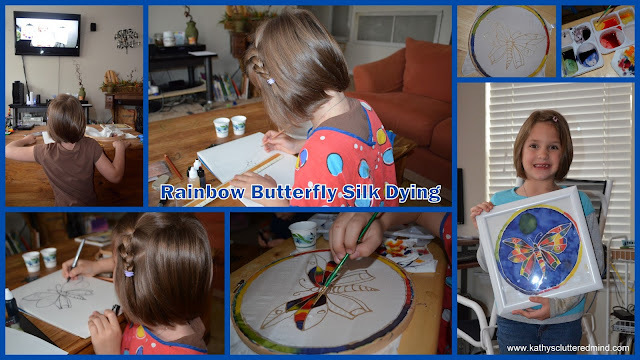 Then we had the privileged of meeting Sharon at a homeschool convention and she was kind enough to give us another DVD "Rainbow Butterfly Silk Dying" as well as the materials. Gwyn was tickled to meet Sharon and even drew her a sunflower with an ink pen on a piece of scrap paper. Both of these DVDs are from Level 1. We are a very artistic family!!! My husband is an artist, I am super crafty and as a result we ended up with two very artistic children. They both have their own artistic passions. Gwyn my 7 year old daughter likes to draw, paint, color, create mixed media art, make crafts, dance, play instruments and sing. Rowyn my 5 year old son just started getting into drawing, coloring and crafting. But he has always had a love for building things with any type of media whether its blocks, legos, cardboard, wood you name it. He also enjoys dancing, playing instruments and singing. My kids LOVE and I mean LOVE looking at artwork at museums. They are able to pick out the tiniest details in a piece of artwork and enjoy giving their thoughts about what the artist was trying to convey. We do art lessons at least twice a week and both my husband and I feel that the arts are an integral part of their education. So when we got the opportunity to review an art curriculum I of course jumped at the chance. Creating a Masterpiece is a full fine arts curriculum and there are 5 different levels to choose from. Sharon walks students through step by step on each DVD. Each DVD is broken into short lessons which are around 15 minutes or so. Total time for a lesson (watching the lesson + completing the lesson task) is around 45-60 minutes depending on your child's skill level. Upon completion of all the lessons on the DVD your child will have a beautiful masterpiece to call their own. It will be a work of art that they will be proud of. These masterpieces will not end up on the refrigerator or in a storage bin. Instead they will be something you will want to show off and display on your wall or table for years to come. Beginners will want to start at level 1 and more advanced artists may want to start at level 2 or above. This curriculum is great for all ages (including adults) and all learning styles. The DVDs did move a little fast for my 7 year old daughter so we did occasionally have to pause the lesson to allow her time to catch up. I realized about half way through the first DVD that it would probably be better to watch the lesson first without trying to follow along. This would allow the child to watch each step more closely and soak in all the information. Then after watching it once or twice go back through the lesson following along and completing the steps. It is a very versatile program and you can figure out which method works best for your family. Creating a Masterpiece will teach children about different techniques, medias, tools and reference tools. Children will be exposed to charcoal drawing, pencil drawing, sculpture, watercolor painting, acrylic painting, pastel painting, ink, silk painting, copper tooling and more. And more lessons are continuing to be added! Creating a Masterpiece is also a Christian based curriculum and often mentions how magnificent the World God created and everything in it is. The supplies needed for each DVD lesson are not difficult to come by and not overly expensive either. Should you wish to order your supplies from Blick Art Sharon even has everything broken down by lessons to make it even simpler for you. Keep in mind as you progress through your the art lessons you will begin to acquire more tools which you will be able to use over and over again so the cost for supplies will decrease. Below I have a breakdown of each DVD we recieved, pictures of Gwyn's finished masterpieces and some more specifics thoughts. 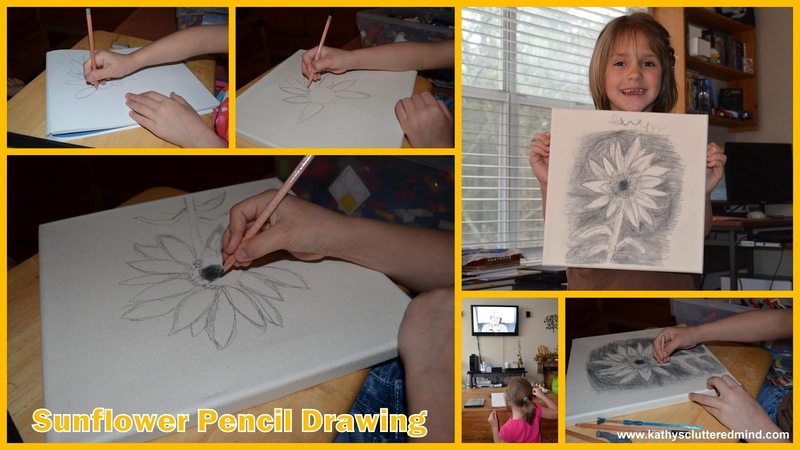 This DVD takes students step-by-step through the process of drawing a sunflower in pencil. Throughout the lessons children will learn why paying attention to detail is important, how to draw lines, curves and points, how to add texture, how to shade and of course how to draw a sunflower. The materials for this lesson included #2 pencil, #6B pencil, drawing paper, a tortillon and a stiff-bristled brush. All I needed to purchased for this lesson was a nice pack of drawing pencils, which I got at Walmart for around $6 and the other materials we had on hand. Okay we did have a few tears over this one...my daughter is a perfectionist. But as you see in the photos below Gwyn's sunflower turned out beautiful. I had chosen the sunflower lesson because it looked like one of the easier lessons in level 1. Well after speaking with Sharon at the convention it turns out I was incorrect and the sunflower is actually one of the harder lessons. But practice makes perfect and after Gwyn practiced and practiced some more on paper she completed her final project on a canvas. The only thing I helped her with was making the tips of the flowers pointed instead of rounded. This DVD takes students step-by-step through the process of painting a butterfly on silk. The DVD explains how to draw a butterfly, use resist, measure with a ruler, mix colors, blend and utilize a color wheel. As I indicated above Sharon gave gave this DVD as well as the supplies to us at the conference. She indicated that it was actually one of the easier lessons in level 1...I was very skeptical. But much to my surprise it was very easy and not messy. And there were no tears just joyful smiles and lots of pride. Gwyn was so tickled she created such a beautiful work of art...and is begging to do more. I priced the materials for the silk dying and it would cost around $20-$25 depending where you purchased the supplies and what you may have on hand. We also had to buy a frame for her beautiful artwork but thanks to a 40% off coupon that only cost us $9! her special touch as she calls it! Be sure to check out Sharon's sample videos on her website. There are only two suggestions I have that I think would make Creating a Masterpiece even more user friendly. One is adding an order in which the DVDs should be completed...like a 1-10 scale of difficulty for each lesson. For example in level one it would be helpful to know that the silk is easier for beginners and that the sunflower is a little more difficult. And two I would love to be able to print the instructions somehow. Printable instructions would make it a little easier for the parent to give verbal directions (especially for younger children) when the child needs it. There were times that I had to rewind, fast forward, pause, etc to help provide additional instruction to my daughter. It was just a little tedious at times. This is a fabulous versatile curriculum and great for all ages and learning styles. It is definitely something we will continue to utilize. Even my artist husband agreed that the DVDs are very well done and thorough. Sharon has a great screen presence, provides easy to understand instructions and uses great visual aids. Gwyn connected with Sharon which is very important for this type of curriculum. I wish I would have requested all of the level 1 DVDs to review...that's how great they are. Gwyn decided to share a vlog about her thoughts. Where to buy:You can purchase these art curriculum DVDs directly off the Creating a Masterpiece website. Each lesson is $35.00 or you can purchase an entire level (6 DVDs) for $179.00. SPECIAL: Use the coupon code setof6 to choose ANY six DVDs you want for $179.00 the coupon codes saves you $31.00!!! Creating a Masterpiece has graciously offered to giveaway a 1 copy of a level 1 DVD (winners choice). Only the first entry is mandatory. Other entries are optional and give you extra chances. This giveaway is not affiliated with Facebook in any way. The winners will be posted on the blog and will be emailed. Winners must reply within 48 hrs with their contact information or another winner will be chosen. Creating a Masterpiece will mail out the prize to the winner. Right now my kids love sidewalk chalk to painting walls. We love art! Paint. It doesn't matter what kind of paint we use. My kids just want to paint! Hard to narrow it down to just one! I will go with paint! My daughters favorite art medium is paint. Any type of paint. My sons both love painting. We do not have an art program we use - I would love to win this ! My older daughter likes to use colored pencils and regular pencils a lot. My younger one likes to paint and use crayons for her creations. My dd uses acrylics & watercolors most of the time, but she enjoys chalks & pastels, too! FAvorite here at our house is colored pencils. My girls would definitely say paint! Thanks for the chance to win. My daughters love water colors. Superb! You have a big potential. Keep it up.